UPDATED: Sun., June 17, 2018, 12:03 a.m.
Four innings isn’t a particularly long appearance for a starting pitcher. But it represents Jake Latz’ longest stint since high school in 2014. 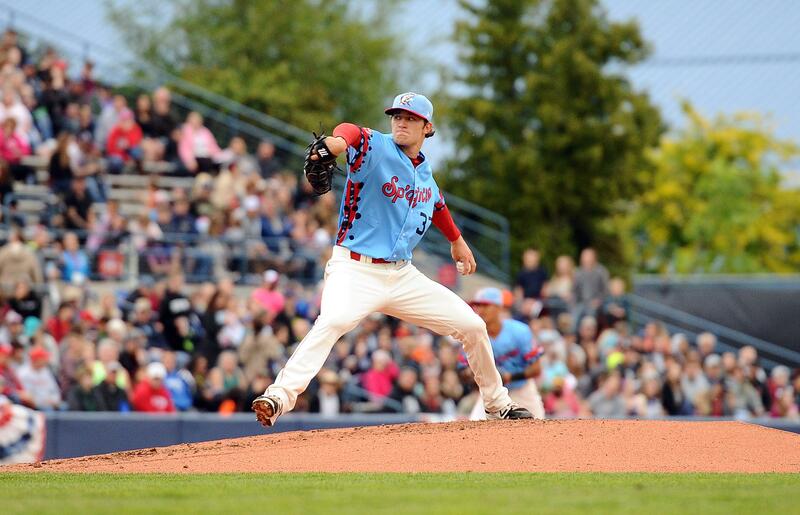 Latz allowed no runs on three hits and three walks with four strikeouts over four innings and the Spokane Indians evened their early-season record with a 6-1 win over the Boise Hawks at Avista Stadium on Saturday. Manager Kenny Holmberg admitted it felt good to get into the win column. “It sure does,” he said. “We came out last night under circumstances that we weren’t ready for and we battled and finished good. I think we came out today and it took a while to get going,” Holmberg added. Latz was selected by the Texas Rangers in the fifth round, 164th overall, in the 2017 MLB Draft, out of Kent State despite not having played that season – or ever – for the school. The lefty was not eligible for competition in a redshirt season after transferring to Kent State from LSU, but apparently impressed scouts that traveled to Schoonover Stadium to see him throw during practice. Once in the Rangers system, he appeared in two Arizona League games last summer, allowing two earned runs on three hits over 2 2/3 innings with five strikeout and two walks. While at LSU, Latz threw just 8 1/3 innings in seven appearances his sophomore year in 2016. He finished 0-1 with a 7.56 ERA with 11 strikeouts and four walks. He started three games, including the Tigers’ Southeastern Conference tournament opener against Tennessee and Baton Rouge regional championship game against Rice – both wins, though he didn’t factor in the decisions. Operating on a limited pitch count, Latz never threw more than 2 1/3 innings in an outing during his LSU tenure. His last extensive playing experience came in high school where he was the Illinois player of the year in 2014 while setting records in ERA (0.22), wins (10), career strikeouts and career wins at Lemont Township High School. That performance garnered the attention of the Toronto Blue Jays, who selected Latz in the 11th round in 2014. But Latz turned down a reported signing bonus nearing $900,000 to attend LSU, where he did not throw a pitch for almost two years due to a nagging elbow injury his freshman year and an undisclosed illness at the start of his sophomore season. Latz gave up some hard contact and a pair of singles in the first inning but also recorded a two strikeouts to escape the frame unscathed. Hard-throwing Boise starter Riley Pint – the Colorado Rockies first-round pick (No. 4 overall) in the 2016 draft – struck out the side in the home half of the first, but also walked three with a passed ball, with a run scoring on a wild pitch. In the third, Latz walked two, then center fielder J.P. Martinez dropped a fly ball in center. Martinez recovered though, and threw out Cade Harris, who was stuck in no-man’s land between second and third. Latz then got Jeff Bohling to roll over to first for the final out. Pint struck out two more in the bottom of the third and his night was over. He allowed one unearned run on no hits with four walks and five strikeouts. Latz gave up a hit in the fourth inning, but collected another strikeout and gave way to reliever Scott Engler for the fifth. Latz went four full and allowed no runs on three hits and three walks, striking out four. The Indians (1-1) collected their first hit in the bottom of the fifth. With two down, Cristian Inoa knocked one back up the middle that ticked off the end of shortstop Kennard McDowell’s glove and went into center field. There was no rally, though, as J.P. Martinez struck out to end the inning. Boise (1-1) threatened in the seventh against lefty Kenny Mendoza, who was assigned to the Indians earlier in the day. With one down, Luke Morgan drew a walk and went to second on a balk. He took third on a groundout and Daniel Jipping reached on a walk, then stole second. But Mendoza coaxed a fly ball to medium left for the third out to preserve the shutout. In the eighth with one out, Mendoza failed to play a comebacker and Aubrey McCarthy reached safely. After a strikeout, Greg Jones laced a single to center and Holmberg called to the pen for righty David Lebron in his professional debut. Lebron walked the No. 9 hitter Cole Anderson to load the bases and Holmberg came out to settle down this year’s 26th round draft pick. Morgan laced a hard grounder to first, but Jonah McReynolds laid out to his right to knock it down, then made a good throw from the ground to Lebron covering to nab the runner to keep it 1-0. Spokane picked insurance runs in the eighth. With one down, J.P. Martinez showed off his elite speed with a triple to the right-center gap, then scored a pitch later when catcher Greg Jones tried to pick him off at third and instead threw it down the left-field line. Miguel Aparicio followed with a double to the right-field corner and went to third on Diosbel Arias’ single. McReynolds lashed a double down the left-field line to plate Aparicio and make it 3-0. Curtis Terry – the team’s home run leader last season – delivered a two-run single to up the lead to five. Obie Ricumstrict was hit by a pitch and Francisco Ventura reached on an error by the third baseman. Inoa rolled one over to second, but it was booted and another run came in. The Hawks scored on a pair of doubles in the ninth against Chandler Sanburn. Published: June 16, 2018, 10:02 p.m. Updated: June 17, 2018, 12:03 a.m.